Convention season is officially underway for 2019! 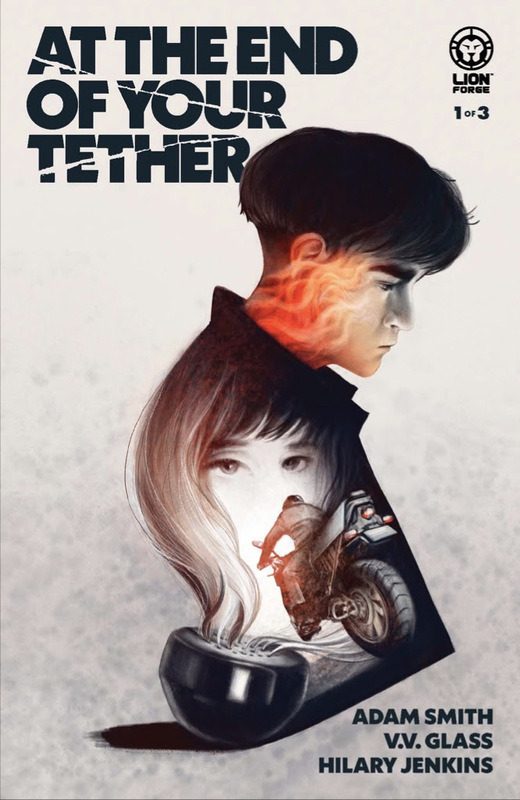 Lion Forge made waves with the announcement of At the End of Your Tether, an all-new original series from Adam Smith, V.V. Glass, and Hilary Jenkins, set to debut this June! It’s 1997 and Ludo is heartbroken. Arlo was the only real bond he had made in a stiff military upbringing. But since a move to a different air base led to their breakup, Ludo has been acting out—fights in school, skipping classes… He feels directionless now, and it’s beginning to weigh on him. News of a trip back to their former home means that he will have to face Arlo at some point, so to ease his nerves, he gives her a quick phone call. Big laughs and a familiar sort of cadence in her voice don’t just instantly calm him down — they make him excited to see her. But when his family shows up at the base the next day, they find out Arlo has been missing…for a week. Ludo can’t figure it all out. He had only spoken to her the night before. Why didn’t she say anything about being in danger? Where the hell is she? Ludo sees an opportunity to redeem himself and takes it upon himself to find her. It’s the first time since leaving that he feels he has a purpose; something he can fix. But as Ludo gets further into the investigation, and details of her disappearance begin to surface, he starts to question how well everyone on base, in town, and even he really knew her. Gone without a trace, the girl he once knew everything about has now become a mystery. Where is Arlo Quinones? At the End of Your Tether will be solicited in Diamond’s April-datedPREVIEWS catalog for release in June 2019. This three-issue limited series features a brand-new expanded 48-page reading experience at a value price of $5.99 and is being offered to retailers as fully returnable. This is the second series in Lion Forge’s new double issue format, which debuts with Palle Schmidt’s Stiletto next month! Lion Forge strives to publish comics for everyone to enjoy, regardless of gender identity, ethnicity, or cultural background. The original graphic novel Andre the Giant: Closer to Heaven was nominated for three Glyph Awards, as well as the Dwayne McDuffie Award for Diversity, and Lighter Than My Shadow was voted the 2017 Graphic Novel of the Year by Amazon. In 2018, the Dwayne McDuffie Award-winning Upgrade Soul was selected as one of the year’s best books by Publisher’s Weekly. Lion Forge Comics includes the Roar imprint for young adults, the Caracal imprint for middle-grade aged children, the CubHouse imprint for early readers, and the Quillion imprint, bringing together comics and tabletop gaming. It is also home to the Magnetic Collection of premium and critically acclaimed comics and graphic novels, boasting multiple Eisner Award nominees. Across multiple imprints and formats that include licensed properties like DreamWorks Voltron Legendary Defender, original works from top independent creators, and the original and all-inclusive Catalyst Prime superhero universe, Lion Forge publishes something for every level of comic book fan, young and old. Lion Forge Comics—Comics for Everyone. Visit www.lionforge. com for more information.